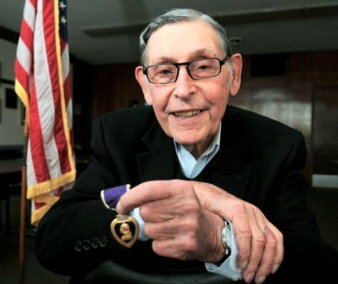 Sam Harris, 90, of Scranton's Hill Section, earned a Purple Heart fighting the Nazis in France, Germany and Luxembourg during World War II. On Christmas Eve, 1944, he was wounded in the right arm while fighting in the Battle of the Bulge. For a good, long time, Sam Harris had little interest in sharing the day-to-day hell that was his life in the final half of 1944. War wounds, at least those of the psychological variety, never go away. And the passage of time doesn't make them any less painful. Still, at some point, "it's good to get it out of your system," according to Mr. Harris. The 90-year-old Hill Section resident said this on a recent afternoon at Scranton's Jewish Community Center, a good six-and-a-half decades removed from his harrowing six-month stint serving in the 10th Regiment of the 5th Infantry Division - nicknamed the Red Devils - of Gen. George Patton's 3rd Army during the Second World War. A sergeant and squad leader, Mr. Harris was 24 years old at the time of his service, still a very young man yet nonetheless one of the oldest guys in his rifle company, which fought along "the front, front lines" of Northern France, Germany and Luxembourg. His tour of duty culminated on Christmas Eve, 1944, when he was wounded during the Battle of the Bulge, the major offensive launched by Adolph Hitler and the Nazis in an attempt to reverse the course of the war, which had been increasingly dominated by the Allied Forces in the months following the Normandy invasion. Fought in frigid conditions in the heavily forested Ardennes region along the borders of Belgium, France and Luxembourg, the month-long battle was the single bloodiest the Americans fought during the war. All told, there were more than 80,000 casualties, including 19,000 deaths. In the end, though, the Allies prevailed and continued on their march to end the Nazis' death grip on Europe. The battle was just one of many vivid combat memories for Mr. Harris. "These incidents happened 66 years ago, and I can remember them as if they were yesterday," said Mr. Harris, who was awarded the Purple Heart for his heroics. "It was very exciting. Exciting and horrible at the same time." In the months following the Dec. 7, 1941, Japanese attack on Pearl Harbor, millions of young men descended on military recruiting stations throughout the country. Mr. Harris still remembers the day he signed up with Uncle Sam - July 13, 1942. He was weeks away from his 22nd birthday. "I felt very patriotic. Not just me, everyone was. You don't see that today, and it bothers me," said Mr. Harris, a trim and vigorous man who walks two miles a day. "We were all excited about knocking (the Germans and the Japanese) out of the box. People were willing to suffer. This was something where everyone was 100 percent behind the government." Upon completing his training, Mr. Harris was sent to Washington, D.C., and assigned to the Motor Corps. He was essentially a chauffeur, ferrying around ambassadors, generals and other men of significant importance to meetings at the Pentagon. "It seemed like the higher up the officer, the nicer they were to the enlisted man," Mr. Harris said. "It was an exciting thing." His then-fiancee, the former Mildred Segal, joined him in D.C., and the two were married on Feb. 7, 1943. In his euphoria, he couldn't help but think that he would remain stateside with his new bride for the duration of the war. That proved to be classic wishful thinking. Thirty-six hours later, word came that a number of men in the Motor Corps were being sent overseas, effective immediately. Mr. Harris asked his commanding officer if he could at least have a few hours with his wife. The officer shot back, "You better, soldier! God only knows if you'll see her again." The orders eventually changed, though, and Mr. Harris was sent for further training, including sharpshooter's school, before heading to Fort Benning, Ga., to serve as a gun instructor. He had a pretty good feeling all of that additional training was going to be put to the test at some point. Indeed, on June 24, 1944, just weeks after the Allies stormed the beaches at Normandy, he set sail for Europe on a ship that had 50 mattresses for 500 men. Mr. Harris slept on the floor. On July 5, he landed in England, spending several weeks there before taking to the choppy waters of the English Channel. He and the other soldiers hit French soil around July 30 and took their place on the front lines with other members of the 5th Division. A couple of days in, Mr. Harris found himself in his first firefight with the Germans. When the initial shots were fired, he was sitting in a field writing a letter to his wife. It didn't take him long to grasp the enormity of his situation. "The first time you see dead people, you feel like throwing up," Mr. Harris said. "If you didn't harden yourself, you were a goner." "I realized, 'Hey, this is a scary place. You can get killed here,'" he continued. "So I made peace with myself. The good Lord is in control. I put myself in his hands." 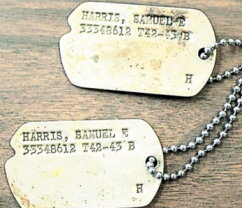 Mr. Harris' two brothers, Phil and David, were also in the service, as were two of his uncles. Phil was a Navy man, while David was a member of the Army Air Corps. One day while out on the front lines, Mr. Harris received a letter from David, who was lamenting being stationed in the states and not getting any action like his brother in the infantry. "So I wrote him a letter. I said, 'What are you stupid?'" Mr. Harris said with a laugh. "He wanted a little adventure." Throughout the course of his deployment, Mr. Harris made a number of good friends, three in particular - an Irishman from Boston named Kelly, an Italian from Brooklyn named Rinaldi and a good ol' boy from Dallas named Long, who once told Mr. Harris, an Orthodox Jew, in all seriousness, "You can't be Jewish, you don't have any horns." Despite their different backgrounds and ethnicities, the three formed one of those incredibly tight bonds that could only be forged in the heat of battle. "It was a wonderful feeling to be like brothers with three other guys," Mr. Harris said. "We thought, 'Why can't the rest of the world be like this?' "
The fighting was one thing. Add to that the often rainy and bitterly cold conditions, and you had the makings of a positively brutal existence. During storms, Mr. Harris's platoon would dig foxholes, then fill them with the branches of nearby pine trees. That way, they wouldn't have to sleep on sopping wet ground. They had galoshes to wear over their boots, but they were so cumbersome that the men just ended up ditching them. Clothing-wise, they had wool underwear and sweaters, but the top layer was nothing more than a light windbreaker that allowed them to shoot their rifles with relative ease but provided little warmth. "It was fierce, the weather," Mr. Harris said. "It was one of the worst things we had to face - cold, rain. Just miserable weather." And, of course, there was the fatigue. One time, Mr. Harris' unit marched for 24 consecutive hours. When the march mercifully came to an end, they dug foxholes to sleep in. That night, they were bombarded by German artillery. At one point, Mr. Harris went groping for his canteen, which he had left outside the hole. "And I take it and it's empty," he said. "I thought, 'Some jerk thought it would be funny to take my water.'" The next morning, he noticed there was a gash in the canteen. It had been hit with shrapnel. Well, better the canteen than my head, he thought. Indeed, that was just one of what Mr. Harris estimates were at least 100 close calls he had during the war. Like the time a shell exploded inside a French-constructed fort along the Maginot Line that they were resting in, or when the 10th Regiment had to cross the Moselle River in little dinghies that were sitting ducks for the German divisions entrenched on the other side. "The casualties were enormous," Mr. Harris said. "It was just about impossible to come out of there unscathed." Mr. Harris' wife was attending services at her synagogue when her rabbi began talking about the brave young men fighting along the Moselle. She knew her husband was there, having faithfully followed the 5th Division's movements via the newspaper. "My wife knew more about where I was from The Scranton Times than I knew myself," said Mr. Harris, adding that Mrs. Harris proved herself a good soldier's wife in other ways, from digging a foxhole in her backyard to see how it felt to sleep in one to mailing Mr. Harris a bottle of whiskey that she cleverly hid in a cigar box. Before heading to Europe, Mr. Harris said many of the troops had notions of the Nazis being some sort of unstoppable force. Quickly, though, they realized that, while good and skilled fighters, the Germans were hardly "the superheroes we thought they were," he said. "The Germans were thrilled to surrender to us," he said. Shortly after overrunning and taking prisoner a group of German soldiers one afternoon, Mr. Harris' platoon was fired upon by enemy artillery located several miles away. So, the Americans and the Germans alike began taking cover in the nearby German-dug foxholes. Unfortunately, the foxholes were only big enough for one person, and Mr. Harris found himself sharing his with a German. Mr. Harris, who spoke a little German, began shouting at the man to beat it. The German responded, "Nein! Nein! Nein!" or "No! No! No!" Determined to get the man out by any means necessary, Mr. Harris grabbed his rifle and threatened to kill him with his bayonet. Finally, the German jumped out of the foxhole and made a mad dash for cover. He ended up getting hit, but he lived. "I was going to kill him," Mr. Harris said. "It's brutal, I know. But it's either me or him to get killed." During another bombing, Mr. Harris' platoon was trying to get a group of German POWs out of a trench. One soldier proved himself to be particularly stubborn, however. Mr. Harris got in the man's face, but to no avail. "I didn't want to kill the guy. He had no gun, he wasn't a threat," he said. Just then, another American soldier, "a Hillbilly from West Virginia," according to Mr. Harris, came up to the German and put his pistol to the man's temple. When he told the German to get up and he still wouldn't budge, he shot him. "I said, 'How could you kill him?'" Mr. Harris said. "He said, 'I asked him like a gentleman and he wouldn't get out.'" The 10th Regiment eventually made its way into Germany, which Mr. Harris found to be much more modern than the French countryside they had spent the previous few months marching through. By then, the Allied Forces seemed to be well on their way to victory. But then, on Dec. 16, the Nazis launched a sneak attack in the Ardennes in a last-ditch attempt to split the Allied armies and cut off their supply lines. One day in, the Germans had broken through the Allied front and created a "bulge." Allied Commander Gen. Dwight D. Eisenhower quickly called for reinforcements, and the 5th Division was sent to counterattack the German flank. Mr. Harris' regiment headed into Luxembourg to engage in highly intense fighting in the cold and snow. On the morning of Dec. 24, the Germans unleashed a barrage of artillery on his battalion. During the ensuing chaos, Mr. Harris jumped into a narrow foxhole, just as an incoming shell was about to explode. "I was an experienced soldier. I knew to jump into this foxhole," he said. "Otherwise, I probably wouldn't be here talking to you." The shell killed three other soldiers in that area, but Mr. Harris had saved himself with his quick thinking. Unfortunately, his right arm was outside the hole when the shell hit, and it took a nasty bit of shrapnel, starting in his wrist and moving up his forearm. From there, he struggled to make his way back to the battalion's aid station. Along the way, he was nearly killed several more times. When he finally made it there in one piece, he was given a shot of whiskey. "Frankly, I thought I had a charmed life. Because all my buddies were either killed or wounded," he said. "I figured I had to get either killed or wounded." He was sent first to a hospital in Paris, then to another one in England. When the wound wasn't showing any signs of healing, he was put on a ship headed back to the States, ultimately ending up at Geshon General Hospital in Butler. By this point, Mr. Harris' arm was "like a dangling fish." His doctors told him surgery was necessary. Even then, there was only a 5 percent chance it would work. "Thank God I was in the lucky 5 percent. It was painful for many years, but I think it was better than being dead," said Mr. Harris, whose arm eventually improved to the point where he could play tennis again. During his recovery, he worried terribly about the friends he had left behind on the battlefront. Later, he learned his friend Rinaldi had been killed the same day Mr. Harris was injured. As far as his other two best friends, Kelly and Long, he never found out what became of them. Mr. Harris was still in the hospital on May 8, 1945, the day the war in Europe ended. But, instead of being overcome with a sense of jubilation, he was "feeling kind of depressed." "When you see your brothers killed, it's just terrible. I can't help thinking of my buddies," he said, tearing up at the thought. "They die for you, you die for them. You're like brothers. It was very emotional." After the war, Mr. Harris returned to Scranton and resumed his life with Mrs. Harris. Together, they raised four children while Mr. Harris ran his family's wholesale dry goods business, David Harris Sons Co. All told, he said, it's been "a long and fruitful life." While he doesn't think about the war everyday, he has little doubt the memories will be regular visitors for the remainder of his days. "They're etched into my brain." Family: Wife, Mildred; three sons, David, Mark and Jonathan, and a daughter, Rebecca; many grandchildren and great-grandchildren. He is the son of the late Harry and Fanny Harris. Professional: Former owner of his family's wholesale dry goods business, David Harris Sons Co.
Military background: An Army veteran of World War II, Mr. Harris joined the service in July 1942. He served in Europe as a sergeant and squad leader with the 10th Regiment of the 5th Infantry Division of Gen. George Patton's 3rd Army from July to December 1944. He was wounded at the Battle of the Bulge. He received a Purple Heart, Good Conduct Medal, Overseas Service Bar and the European-African-Middle Eastern Theater Service Medal with three Bronze Stars.